So, what is LLLT? LLLT stands for Low Level Laser Therapy. Essentially, LLLT is a light therapy that uses lasers, or LED light therapy to repair tissue and reduce pain and inflammation for a patient. This treatment has grown in popularity over the past decade, and now is actually even used in helping reduce pain caused by cancer treatments such as chemotherapy and radiotherapy. LED Light Therapy, or LLLT is an affordable and painless treatment that utilises multiple wavelengths of light energy to reach skin tissue at underlying levels and can be used to treat a wide range of skin conditions. Here at our Liverpool clinic we love the incredible benefits LLLT can provide for our clients, which is why we add a single session as standard to all skin treatments we offer at our clinic to boost results and reduce inflammation. Due to the fact that LLLT is such a popular treatment, we offer a range of different LED therapies here at our Liverpool clinic. We offer red light, blue light, yellow light and green light therapy. Different colours of light actually have different benefits for our clients. So, what is the science behind LLLT? Low level laser therapy (LLLT), also known as photobiomodulation, was found to be able to stimulate growth in cells over 50 years ago. Endre Mester, a professor at Semmelweis University in Budapest, Hungary, found that by applying laser light to the backs of shaven mice, he could encourage the shaved hair to grow back more quickly than in unshaved mice. He found this out back in 1967, and soon after, started to test out his theory on human patients too. He used lasers to treat patients with non-healing skin ulcers to promote the healing process of their cells. A little later on, after Mester’s research, Red Light Therapy was used by scientists to help grow plants in space In the early 1990s. They had found that the light-emitting diodes (LEDs) that came from the intense red light actually helped to promote growth of plant cells. Red light therapy then became more commonly used, and in medicine they wanted to see if light therapy could also promote energy inside human cells. It is still being studied today to monitor its effectiveness – but, there are many cases where it has been very effective in stimulating healing in various skin conditions and producing energy. The theory put forward by research has found that red light may produce a biochemical effect in cells. A biochemical effect essentially means the chemical processes and substances which occur within all living organisms. This biochemical effect produced by the use of light therapy is then thought to strengthen the mitochondria. Scientifically speaking, the ‘mitochondria’ are the powerhouse of the cells within our bodies (as this is where energy is created for the cell). The energy-carrying molecule found in the cells of all living things is called ATP (this stands for adenosine triphosphate). Scientists wanted to see if LLLT, or Red Light Therapy could promote growth in human cells as it had been used to do in space. It is thought that the Red Light Therapy works to increase the function of the mitochondria. This increased function within the cell, in turn, allows the cell to create more ATP. So, LLLT stimulates more energy within a cell, and with more energy, our cells can function more efficiently. LLLT is thought to allow our cells to rejuvenate themselves and repair damage more effectively as they have much more energy to do so. LLLT or Red Light Therapy doesn’t cause any damage to the surface of the skin. The light emitted penetrates around 5 millimeters below the skin’s surface meaning it can directly stimulate a regeneration of the skin (by encouraging cell growth) without damaging the outer layer of the skin. Today, LLLT is used in three main ways – to reduce inflammation, chronic joint pain and edema and also, to stimulate the healing of wounds, deeper tissues and nerves. 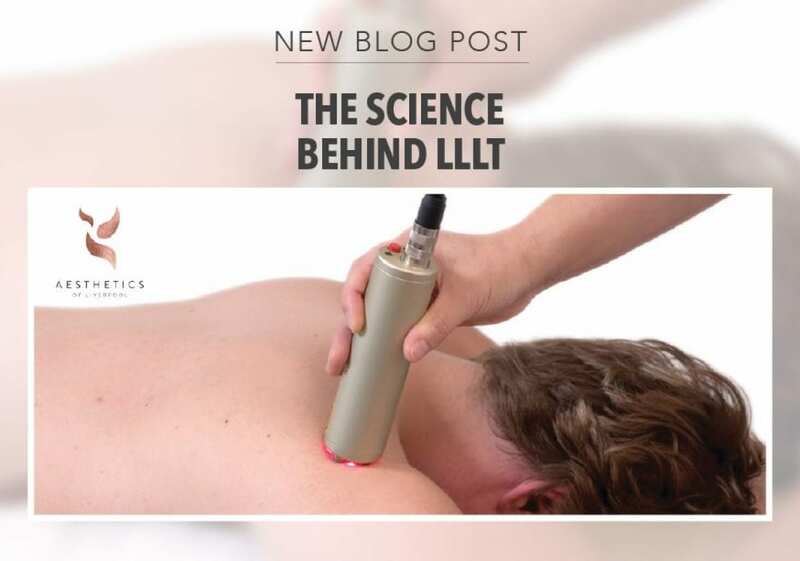 So, now we’ve looked into the science behind LLLT therapy, let’s take a look at each of the different colours of light therapy we offer here at our clinic so that you can decide which might be the best treatment for you. Red light therapy has many different names, and you may have heard it called photobiomodulation (PBM), soft laser therapy, cold laser therapy, biostimulation, photonic stimulation, low-power laser therapy (LPLT) or as low level light therapy (LLLT) which we will refer to it as in this article. It helps rejuvenate facial skin and smooths skin tone. Red light builds collagen in the skin to reduce wrinkles. Promotes wound healing and tissue repair. It helps to repair sun damage or damaged skin. Red light activates the lymphatic system for potentially improved detoxification. Decreases inflammation in the skin. Helps fade scars and stretch marks. Improves hair growth to reverse balding. Can prevent recurring cold sores, or herpes simplex. So, with all these incredible benefits our clients can expect with treatments from red light therapy it is easy to see why it is such a popular choice. As we mentioned, we offer a single session of LLLT to every skin treatment as standard, but we also offer our light therapy in packages of six sessions for really incredible and lasting results. The next type of light therapy we offer at our clinic is blue light. Like red light, blue light therapy can be used to treat many types of skin disorders. It can be used to improve your skin’s texture and reduce sebaceous hyperplasia, or enlarged oil glands. Blue light therapy can also help with removing unwanted sun spots or pigmentation in the skin, acne, and even scars that were originally caused by acne. Many of our clients also see vast improvements with their complaints of psoriasis, eczema and pigmentation. Pigmentation in skin is one of the most common complaints we deal with here at Aesthetics of Liverpool. Unlike many other salons and clinics in the area, we are adept at working with all skin types on the Fitzpatrick scale and are very confident when working with skin types 4-6 on the scale to give all our clients the best skin they can possibly have. Yellow light therapy is another type of light therapy that we also offer our clients. Yellow light reduces the appearance of redness, swelling, and inflammation. This colour of light is beneficial for Rosacea and treating burns such as sunburns. Yellow light therapy also stimulates the production of red blood cells in the skin and, like blue light therapy, is effective in treating abnormal pigmentation in the skin (hypo and hyper). improving lymphatic function, and stimulating circulation. Yellow light can also boost the production of the feel good hormones in our body, this means not only is it great for physical ailments, but it can also work really effectively when treating conditions like SAD (seasonal affective disorder) working as a method to lift the mood when needed. The last colour of light we offer here at our Liverpool clinic is green light therapy. Green LED Light Green light is absorbed into the skin where it has a calming effect. Like the other types of light, it can work really effectively on unwanted pigmentation in the skin. Green light therapy can help to lighten hyperpigmentation spots revealing a brighter complexion for our clients, no matter their skin type. The calming effect that is produced by this type of light therapy also has anti-inflammatory properties that soothe the surface of the skin. Green LED Therapy is used to treat dilated capillaries, sagging skin around the eyes, under eye circles, hyper-pigmentation and sun spots, even sagging breasts. As we have mentioned, when you book in for any professional skin treatment with us, you will receive one LLLT treatment as standard. Alternatively, you can go ahead and book in just for LED light therapy to reap the incredible benefits this treatment has to offer. If you are unsure as to which type of light would be best for your skin type, we offer a skin analysis consultation here at our clinic for only £50, where our professional practitioners will work with you to help you understand what your skin needs. After this in depth consultation, if you do decide to book a treatment with us, the cost of the skin consultation will be taken off the total cost of your chosen treatment.